Evaluate and perform U operations with higher roots. might want to memorize them. means that b^n = a. (b ≥ 0). If n is odd, a and b can be any real numbers. because 43 = 64 and because (-2)5 = -32.
symbol is called a radical and a is called the radicand. roofs, but is necessary with even roofs. The product and quotient rule apply to cube roots, fourth roots, and all higher roots. Find the greatest perfect fourth power that is a factor of 32.
greatest perfect fourth power that is a factor of 32.
terms. 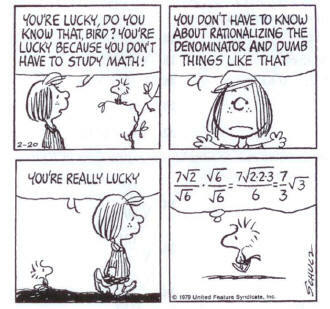 The same idea applies to adding and subtracting nth roots. exponent is the radical's index. The denominator is the index. The base is 16 and the negative sign is not affected by the exponent. Parentheses show that the base is -27 and that the negative sign is affected by the exponent. The numerator is the exponent. Group factors with the same base. that the root is not a real number. 23-32. Assume that x > 0. 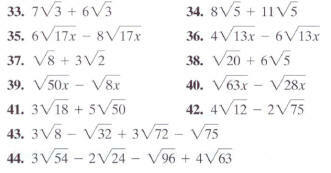 In Exercises 33-44, add or subtract terms whenever possible. 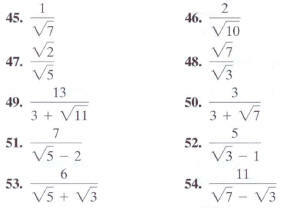 In Exercises 45-54, rationalize the denominator. root is not a real number. 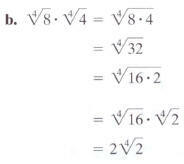 Simplify (he radical expressions in Exercises 67-74. 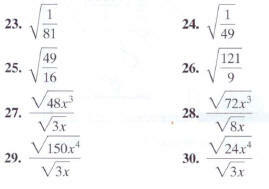 In Exercises 75-82, add or subtract terms whenever possible. 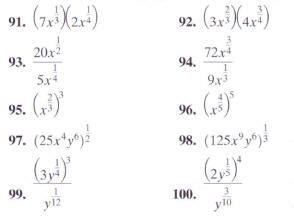 In Exercises 91-100, simplify using properties of exponents. 1n Exercises 101-108, simplify by reducing (he index of the radical. In Exercises 109-110, evaluate each expression. the horizon. Use this formula to solve Exercises 115- 116. 115. The pool deck on a cruise ship is 72 feet above the water. nearest tenth of a mile. the nearest tenth of a mile.